UNITED NATIONS, Apr 7 2014 (IPS) - A message of hope has been delivered to the people of Syria in the form of generous humanitarian aid from an oil-blessed Gulf nation: Kuwait. Speaking at a ceremony Monday, Assistant Secretary-General in the U.N. Office for the Coordination of Humanitarian Affairs (OCHA) Kyung-wha Kang said that Kuwait’s contribution to the United Nations and the international humanitarian system goes beyond monetary values. In January 2014, Kuwait pledged 500 million dollars in humanitarian funding to Syria and has since delivered 300 million dollars of that pledge. 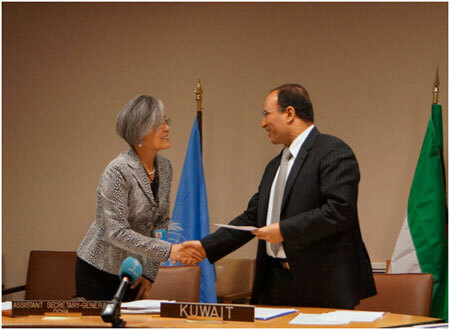 Kuwait presented four cheques to OCHA, U.N. Children’s Fund (UNICEF), U.N. Development Programme (UNDP) and to U.N. Relief and Works Agency (UNRWA). In Geneva, four other agencies also received cheques from Kuwait totalling 205 million dollars. The support from Kuwait has helped U.N. agencies provide assistance to alleviate the suffering of the Syrian people affected by the crisis, Kang said. “We hope that our contributions will encourage other donors to deliver on their commitments,” said Ambassador Mansour Ayyad Al-Otaibi, the permanent representative of Kuwait to the U.N. Since the second pledging conference in January, only 30 percent of the pledges have materialised, said Kang. “With the Kuwati cheque, it is still only 44 percent of the pledged amount. Many of the pledges from other countries have not come through yet,” Kang told IPS. Kuwait will channel half of the 500 million dollars to the U.N and its specialised agencies, and the rest to Kuwaiti non-governmental organisations (NGOs) and the Kuwait Development Fund. “The state of Kuwait highly appreciates and values the roles of the organisations and entities benefitting from the donation and hopes that it will help end the suffering of the Syrian people,” Al-Otaibi said. Kang said areas that were in urgent need of help were the provision of food assistance, health services and medical supplies, non-food relief items, education, early recovery support, nutrition, protection-related activities and water, sanitation and hygiene programmes. “Timely funding, such as this donation from Kuwait, is essential to ensure that supply pipelines are not interrupted and we can use the most direct routes to bring these supplies in,” she said. According to the Financial Tracking Service (FTS), countries such as Qatar, Iraq and Oman have pledged 60 million dollars, 13 million dollars and 10 million dollars respectively, but have not committed any amount to the fund. “This generous contribution from the State of Kuwait will bring a message of hope to the people of Syria and make a real and tangible difference in the lives of hundreds and thousands of Syrians,” Kang said.